The Mel Brooks video of the previous post reminded me of another contemporary take on the musicality of Adolf, this time hunkering down in his bunker. Walter Moers, a German author, created this great take on the absurdity of Hitler in today’s world. Has it really been a quarter of a century since Mel Brooks re-made Ernst Lubitsch’s To Be Or Not To Be? Here’s a little hip-hop number of the same title with Mel Brooks qua Josef Tura qua Adolf H.
... in “Valkyrie” Singer opens the door to a dangerous new thought: that the Holocaust and all the other atrocities could be of secondary important to the cause of German patriotism. Not once in “Valkyrie” do any of there “heroes” mention what’s happening around them, that any of them is appalled by or against what they know is happening or has happened: Hitler has systemically killed millions in the most barbaric ways possible to imagine. A good list of Hitler assassination attempts is here, some by people less reprobate. 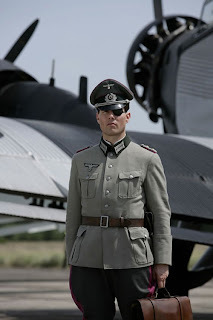 Many involved in the German resistance were less bloody-handed than von Stauffenberg: for example the leader of the anti-anti-Semitic Confessing Church in Germany, Dietrich Bonhoeffer, hanged with piano wire during the post-Valkyrie purges, and the Weisse Rose, all beheaded by the Gestapo in '43. 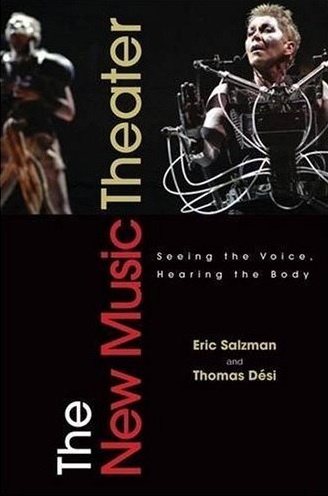 My literate writing time recently has been spent primarily on the blog I started with my sometimes librettist and always friend Jim Bisso, the explanation for which is somewhat difficult but is revealed by the gestalt of the postings en masse. UPDATE: this blog is no more, but its core has been folded into the E.W. blog hierarchy. But I'm now in the process of composing a new waltz for Lynne, a companion piece as it were to the old one, both of which will be presented by the orchestra in the most waning day of February. My visit to New York has imbued me with a deep piety for all things artistic and renewed appreciation for hard driving ambition and a work ethic that allows not for fiddle-faddle. I met Jesus tonight at a Party. He offered me a vegan sweet as the body of Christ. I told him that I had written much music to his glory. He laid his hand on my head and blessed me. Erling (explaining things to Bruce): I'm not actually pro-Nazi, I'm just fascinated by the Nazis. Bruce (in simulated conversation, mockingly): voice 1: Oh, I don't actually like chocolate, I'm just fascinated by chocolate. voice 2: Oh, really, what is it that fascinates you? voice 1: The taste! Jim (in response): Oh, oh. I think we, and our age cohort, were inoculated with a dirty Axis needle. All those movies, TV shows, cartoons, and other ephemera. But I know what he means, whenever looking into any of this stuff online, I run across both ends of the spectrum (from Holocaust to Neo-Nazi sites), but it's the ones in the middle that usually give me pause. Those U-Boot, Axis military history, Waffen-SS, Iron Cross medal winners, that profess a fascination (phallic gazing) with but protesting an utter horror of Nazis. "The greatest happiness is to vanquish your enemies, to chase them before you, to rob them of their wealth, to see those dear to them bathed in tears, to clasp to your bosom their wives and daughters." From Anonymous Admirer: The historian Peter Gay (né Peter Fröhlich) wrote in the preface of his poignant memoir, My German Question: Growing Up in Nazi Berlin (1998), And so I asked myself, Why didn’t we pack our bags and leave the country the day after Hitler came to power? It was an agonizing question that I am going to ask again and again in these pages. I came to believe that I could appear as a witness as well as taking satisfaction from unsparing self-examination—and, I hope, giving satisfaction as well. Whether I have succeeded is not for me to say. 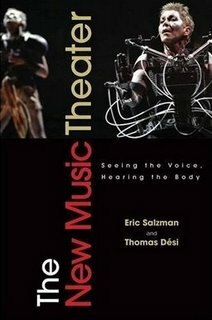 But if I had thought I had failed I would not have published this book. Gay was born and raised in Berlin and lived there until, at age 16 and just after Kristallnacht, he and his family left for the United States via Cuba. There is quite a wonderful archive of German propaganda from the Nazi years and beyond at the Calvin College website. Propaganda works quite well, and the average person basically accepts it either whole or half heartedly, and so it's worth a look to see something of the point of view of the Germans during the conflict. As an example, the cartoon on the right is quite enlightening. The context is the (from our point of view) accidental bombing of Switzerland, a 'neutral' country (more on that in a later post). The guilty airman is being questioned as to why he made the mistake and his response is that the flags of Switzerland and the Red Cross look so similar. 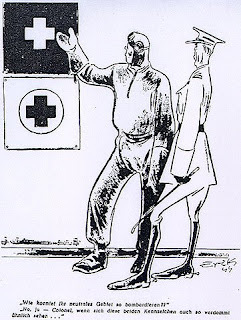 To understand the humor of this cartoon, you have to know that it was a common belief in Germany that the Allies were deliberately bombing hospitals and Red Cross vehicles and facilities. Maybe we were, maybe we weren't. In Chunk Yeager's autobiography, he describes being given an order to go to a particular mile-square grid location in Germany and kill every living thing in it: person, animal, etc. He says he didn't feel too good about it, but he did it because that's what you did when you were given an order, the classic Nürnberg defense. Luckily for him, there are two major requirements for being a war criminal: one is committing the atrocity and the second is losing the war. Victors so write the history books as we know. In the afterword to The Rise and Fall of the Third Reich, William Shirer looks back at the unexpectedly overwhelming response to his book, positive in the former Allied countries and decidedly defensive in the former Axis. In recalling the attack on the book by the then-chancellor Konrad Adenauer, he points out that the Germans simply could not face up to their past, i.e., rampant adventurous conquest and slaughter. It is in this context that he discusses, as he calls it, 'The German Problem:"
And now, as the thirtieth-anniversary edition of The Rise and Fall goes to press, the world is suddenly confronted with a new reunification of Germany. Soon, united, Germany will be strong again economically and, if it wishes, militarily, as it was in the time of Wilhelm II and Adolf Hitler. And Europe will be faced again with the German problem. If the past is any guide, the outlook is not very promising for Germany's neighbors, who twice in my lifetime have been invaded by the Teutonic armies. The last time, under Hitler, as the readers of this book are reminded, the German behavior was a horror in its barbarism. This raises the curious question: is there really something different about the Germans, different from the rest of us? If we say, yes, that there is inherent evil in the German People, then aren't we faced with an issue similar to that hallucinated by the Nazis, i.e., the alleged "Jewish Problem?" Or was Hitler somehow irresistibly charismatic and is there something inherently evil in all of us, although a difficult and bitter cup to drink, possibly true, and, as we face the current descent into economic chaos and the decline of the American Empire, maybe a glimpse into our own future? To facilitate this process and to reassure other countries, some changes were made to the "Basic Law" (constitution). Article 146 was amended so that Article 23 of the current constitution could be used for reunification. 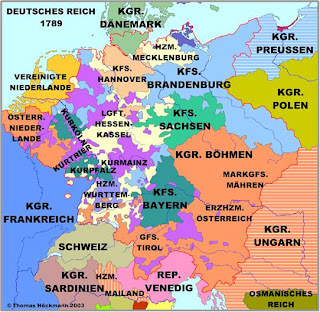 After the five "New Länder" of East Germany had joined, the constitution was amended again to indicate that all parts of Germany are now unified. Article 23 was rewritten as keeping it could be understood as an invitation to e.g. Austria to join. However, the constitution can be amended again at some future date and it still permits the adoption of another constitution by the German people at some time in the future. The final line is, of course, the kicker, and shows the apprehension of the encyclopedist, but I guess, if I had to choose, gun held to my head, that there is a little German in each of us, that given the proper confluence of economic misery and jingoist propaganda, we could find ourselves swept away, wondering why the bombs are now falling on us. No, wait, I'm wrong, it really is just them - the evil others - and now I may sleep a bit more soundly. I had a lovely visit with my Art History Teacher Aimée Brown Price, whom I hadn't seen in a dog's age, today and noticed some Polish and Polish-Soviet War and Nazi Resistance art sitting about. Created soon after the war, they show a somewhat romanticized view of the Soviet involvement in the liberation. My fellow new music blogger Kyle Gann recently wrote a discussion of a discussion of the Nazis and the Republican Party, but the truth is you can't really compare anything to the Nazis. They are just too big. As Godwin's Law implies, they are the super-ultra-end of all comparisons, off the charts. Hollywood and the Video Gaming industries have always plucked them out of the bag when they need some Unrepentant Evil that requires no character development, no softness, no compassion, no other side to the argument that is their malevolence incarnate. I remember reading that Kubrick always wanted to make a film on the Holocaust but decided that it could never be done, that Schindler's List isn't really about the Holocaust, it's actually about the opposite of the Holocaust, hope in the face of hopelessness, but the reality of the Holocaust is really the all-encompassing horror of horror and hopelessness without end, with no escape, an abyss and a void, even the concerted disremembering of its own existence in the fall of the Reich. Even The Producers, which so wonderfully skewers the Prussians, doesn't mention the Shoah; its inconceivable savagery would overwhelm. The Fox News-ites who paint Obama as a Messianic Charismatic Hitlerian figure who will lead us into a Götterdämmerung are simply idiotic, simply haven't read their histories. There is no way to again be as big as he was, as big as they were.